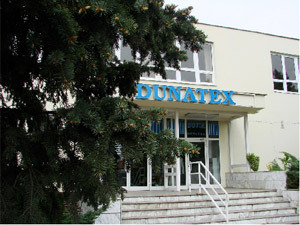 Dunatex Company was founded as association of physically disabled people and in 1991 at 1. January started with 320 members independently work in production of work wear. Due to changes in legislation but also to demand increase of the job the whole work team lost his character of the disabled. Our success was to establish sheltered workshop where a smaller number of disabled people found their job. We are one of the largest companies in the area and thus substantially affect employment in the region Dunajska Streda. In 1998 the number of employees ranged from 280 to 350. At present time as a result of crisis it has fallen significantly. However we tried to maintain in work process the greatest number of workers with reduced working ability. Our company is created in production workshops for sewing itself, a workshop on quality control and packaging and also cutting workshop. The workshop No.2 was created with idea that we can get a job for people with reduced working ability. Sheltered employment take effect from 1.November 2001 with 35 workers and an average age 45 years. On 31.May 2011 the company employed 126 people of which 104 have been working in production. At the same time in sheltered workshop have been employed 25 workers thereof 13 with reduced work ability.